Sensitivity to gluten is a serious issue in modern health. People suffering from it have difficulty digesting gluten and are consequently deprived of essential nutrients. The issue has been connected with a shockingly wide amount of disease and health issues ranging from skin problems to dementia and celiac disease. The problem is that doctors have restricted testing for celiac disease only and ignored gluten sensitivity or non-celiac gluten sensitivity (NCGS). However incompatibility with gluten doesn’t have to be associated with celiac disease, therefore diagnosis for it is severely limited. In other words, there are various degrees of gluten sensitivity, but for many doctors it is either you have celiac disease or you have nothing. Nowadays there is more awareness of non-celiac gluten sensitivity (NCGS) and it is a distinct clinical condition. NCGS (non-celiac gluten sensitivity) or gluten sensitivity is a gluten intolerance that is not related to celiac disease. Some estimates say that around 1 in every 20 Americans has a type of NCGS. Medical experts that were curious about the issue conducted a placebo-controlled gold standard and double-blind, placebo-controlled trials on gluten ingestion. In the end they were able to validate the condition of gluten sensitivity apart from just celiac disease. What is Gluten Sensitivity (Non-celiac Gluten Sensitivity)? When your body has a sensitivity to gluten it has adverse effects on every inch of healthy tissue in your body. Medical experts are now shocked to find that this sensitivity might be a lot more common than we previously thought. The first step in validating any gluten health concerns is educating yourself. Since there has been an alarmingly small number of medical studies on gluten sensitivity (NCGS), patients have been forced to take matters into their own hands and look for symptoms. The most obvious indication of gluten intolerance is digestive issues. This includes bloating, gas, abdominal pain, greasy stools, and irritable bowel syndrome. Several types of rashes like eczema and psoriasis may appear on your skin. Look for areas that are dry and have red or white marks that cause itching. A scientific study found that “gluten intolerance gives rise to a variety of dermatological manifestations”. Issues with hormone balance that cause worsened PMS symptoms can be caused by NCGS. Instances of inexplicable infertility may also signal a difficulty digesting gluten. Make sure you don’t have these signs of hormonal imbalance. Keratosis pilaris might also develop on the skin as a result of gluten intolerance. 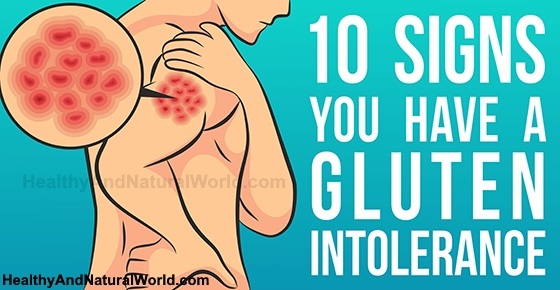 It is characterized by rough discolored bumps and hardened skin around the thighs, arms, and cheeks – usually happening when gluten damages the stomach. Joint pain and inflammation could be a result of gluten intolerance. The lack of digestive clues makes it difficult to associate with gluten sensitivity. Many doctors find the symptoms but fail to associate them with gluten sensitivity. Remain objective about your symptoms and talk things over with a physician if you’re concerned. As mentioned earlier, the medical focus on gluten intolerance (NCGS) is disappointingly small. Because of this there aren’t many testing methods available at the moment. Only two methods are worth trusting: blood testing and an elimination diet. Blood testing is fairly straightforward but many people have been drawn to the simplicity and ease of elimination diets. If you’re exhibiting any symptoms of gluten sensitivity it could work for you. As for elimination diet, the first step is finding everything with gluten in your daily diet. Avoid eating those foods or any other that might give you digestive troubles. After approximately 3 weeks take note of the symptoms. If they’ve gotten better, chances are your body cannot tolerate gluten. The important part of this diet is staying committed. You can’t consume even the slightest amount of gluten during your elimination period. If you do so, it could offset the entire process and give you faulty results. Start shopping in the gluten-free alternative section. There are a ton of options like pasta and bread so you don’t have to cut all your favorite foods. Any grains that use wheat, rye, or barley need to be avoided completely. Carefully read the labels of your groceries and look for gluten-indicating terms such as vegetable protein, flour, soy, vegetable hum, and malt flavoring. Reading food labels is also one of the 70 habits featured in my e-book 70 Powerful Habits For A Great Health which will guide you how to take positive steps to improve your wellness and overall health. Always choose whole foods over anything that is processed. Have some digestive aids handy in case you do consume gluten accidentally. Here is a delicious and easy gluten free recipe with one of my favorite vegetables – Cauliflower. This recipe uses the cauliflower florets (but don’t throw the stem as it is edible too and can be added to a soup). The key to making good cauliflower bites is to have them crispy and golden on the outside and soft on the inside, so you will have delicious snack or appetizer. Preheat the oven to 450F (230C). Combine the water, flour, garlic powder, salt and paprika in a bowl and stir until well combined. Coat the cauliflower pieces completely with the batter and place them on a lightly greased, non-stick baking sheet. Bake for about 15- 20 minutes (or until the tops start to get color on them), tossing half way through. When the cauliflower is done, remove it from the oven and gently toss it in the hot sauce mixture. Place the cauliflower bites back on the baking sheet and bake for about 5-10 minutes, or until cauliflower is crispy. Allow cauliflower to cool for 15-20 minutes before serving. You can serve it with tzaziki or other favorite dip. I noted, finally, a gluten sensitivity last year – about the same time I went from vegetarian to vegan. It’s been difficult with those two changes, but I love being a vegan. What digestive aids were you writing about in case one consumes gluten accidentally, which I’ve done? what’s the cure of stomach burning & movement sensation in the feet, & pale of the skin? Hi Solomon, it’s sometimes difficult to give advice over the internet, especially that there are questions to be asked about the symptoms and your medical condition. I think it is something that needs to be treated by your doctor, who is familiar with your medical history and can look at it more deeply and perform the required tests if needed. I apologize I cannot be of any help. I was diagnosed with gluten sensitivity 5 years ago and it included not only wheat products but eggs and dairy. I could handle eating for gluen sensitivity BUT I am also a type 2 diabetic…. So what I can eat for one condition I can’t eat for the other. So I give up and just eat except I try to delete the processed foods which is good for both. Does anyone else have this problem? I am almost 81 years old with no self discipline and tend to have food habits from this long life. Not a good thing!!! I also have numerous medical conditions linked to both things. I have been struggling with acid reflux and hives for 4 years, the last 2 I’ve had severe scales of skin that itch even bleed. I can’t control it! I have IBS add well as panic disorder and I have an allergy to eggs milk and all all all citrus acid. I’ve tried Apple cider vinegar on scalp, it relieved itching and scales but it returns and I did it again the other day but it didn’t help. I’m under stress Yes, but this is all to much. I also drink on weekends, thinking that should stop. I don’t know if I’ve got yeast growing or what. Hi Roberta. You didn’t mention whether you have made any changes in your diet since discovering your food allergies. I would definitely eliminate all dairy and eggs but I think you should consider eliminating gluten as well to see if there is any improvement.That would include your weekend beer. You mentioned yeast and that is a big possibility. Many people have a Candida tray overgrowth and don’t realize it. You can purchase a Candida cleanse from a health food store but you will need to follow a fairly strict diet and eliminate sugar and simple carbs during the cleanse. It’s worth the trouble! Best wishes to you and God bless! Hi Jenni, I can understand your frustration as gut issues are quite broad and can range from food sensitivity of various degrees, IBS, IBD, ulcers, etc, and it might also be a combination of other things, for example liver issues that can affect the gut or hormonal imbalance such as in menopause. As you can see, it requires quite a deep investigation (which some of it you’ve already done). Unfortunately this is beyond the scope of my abilities, but sometimes you may found that going to have a second opinion from another doctor that can bring a fresh insight to your situation can be beneficial. I apologize I cannot be more specific with any suggestion. Your article made it easier to understand gluten intolerances than others I’ve read. My son has been dealing with frequent stomach pains for over two years. His doctor wanted him to take Prilosec. Helped while taking it but didn’t last. Something I read suggested increased acid chloro something could be an issue. We have him drinking aloe 2 to 3 times a day to lower the acid. It’s has been helping but we just started this. Reading about gluten makes me wonder if this should be our next step. It was simplified for me too. To remember basically 3 ingredients to avoid seemed so much easier than looking for items that say gluten free. This article was a round about link that started from a Facebook post about Nutella and the break down of ingredients. Very eye-opening. Thank you. my son who is almost 4 now,(exclusively breastfeed) was diagnosed with cow`s milk protein allergy when he was 3 months old.he was having diarrhea full of mucus and little blood in his stools but as soon as i(mother) stopped taking any dairy/soy products he got better. but when i tried to give him solid food at age of 7 months he again have blood in his stools.at this i stopped giving any type of grains.for the last 3 years he`s been on vegetables and meat.but he is weak.hundreds of doctor visits and 3 different naturopath doctors but nothing. they don`t see this more than a case of constipation. Hi Karen, I sympathize with your frustration and your concern to your son. The problem is that I’m not a doctor or a certified health practitioner, hence I cannot give specific advice. This is true especially in such a complex issue that requires an in-depth knowledge, and where so many other health practitioners have failed to give you a solution. I feel that any advice given by me over the internet without the specialized knowledge required and without knowing the full medical picture would be irresponsible, and I don’t want to make more harm than good. So please accept my apology for not being more helpful. I really hope you find the right practitioner that will listen to you and take your concerns seriously and will be able to find a solution. I was diagnosed about three years ago with Ciliacs. But I didn’t go to a doctor for my digestive problems not till my husand heard the symtoms on Doctor Oz and made me looked it up to see I didn’t have most of the symptoms. I had all of them. And I realixze now I have had the symtoms all of my life even as a small child and the doctors had missed it. By the time I found out it was to late and the dammage was done. I nearly died of a gall blader attace that made my gall stoees rip oppen my intestine. Point is we should get these things tested when we are small correct our diet now before like me they nearly die. A symptom not listed in the 10 symptoms is leg cramps. My husband has celiac disease and after much extensive research, it’s almost impossible to be 100% gluten free. Gluten is not only in food, but also in makeup, shampoos and body wash, soap, detergents, toothpaste, etc. The list goes on and on. Hopefully one day something will develop to cure these intolerances.